The Design View of a Table is divided in 2 parts: the upper portion is used to introduce the basic characteristics of the commands, which we have seen in previous Lessons. The lower portion is used to introduce the Field Properties. As you can see, the lower portion has two tabs. The first one, "General", is used to define the properties. We will see more on the second tab, "Lookup", some other time. 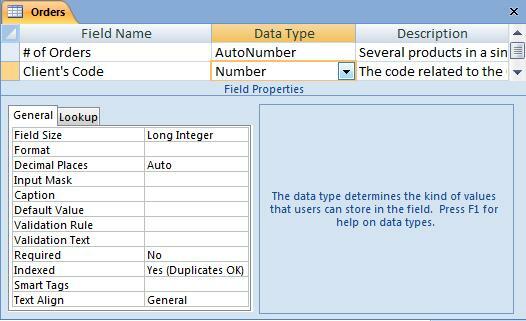 The field properties vary depending on the Data Type we have selected (active) at the moment, for example, the properties for an Autonumber field are: "Field Size", "New Values", "Format", "Caption", "Indexed"; also "Smart Tags" and "Text Align". The properties for a Number field are: "Field Size", "Format", "Decimal Places", "Input Mask", "Caption", "Default Value", "Validation Rule", "Validation Text", "Required", "Indexed", also "Smart Tags" and "Text Align". And this is the same for other Data Types. "Field Size": Determines the number of characters a Text field may have. In Number fields, it determines the largest number which can be introduced. "Format": Allows us to show dates and numbers with a specific format. "Decimal Places": Determines the number of decimal places to be shown in numbers or currency. "Input Mask": Forces the data introduced in a field to be adjusted to a specific format. "Caption": Specifies the name to be used in Forms and Reports instead of the Field Name. "Default Value": The value which the field will acquire by default whenever we add a new record. "Validation Rule": Determines the conditions which must be complied by the data we want to add to the table before being accepted. "Validation Text": Establishes the Text of the message that will appear if the data we introduce doesn't comply with the validation rule. "Required": Indicates that it is obligatory/compulsory for us to introduce a data in this field. "Allow Zero Length": Allows chains of Zero Length to be saved in a Text or Memo field. "Indexed": Determines if this field will be an Index for the Table. This topic will be seen in detail in later lessons.